Robyn and Phil turn their attention to the bedrock of management reporting, the Pivot Table. Under Phil's 'wild man' influence, they end up with some rather radical ideas. There comes a time with many Database Developers charged with doing management reports when the process of doing it properly gets very tedious. By ‘doing it properly’, I mean the ‘best practice’ of having to do the basic reporting in SQL and relying on a front-end application to do the presentation. This is particularly true where the management want simple aggregate reports, or ‘Pivot-table’ reports. Presentation is so closely tied with the data that splitting the process can sometimes lead to more problems than it solves. Of course, we have Reporting Services, Analysis Services and other external tools, but there are times when a simple solution based in TSQL has the upper hand. Anyone who was weaned on Excel knows that these pivot tables are dead simple. You select your data, bang the button and with a bit of dragging and dropping, there it is. Why, they ask, is it so hard to get it out of the database? Why so hard to make changes? Now, you’ll notice that we’ve taken a bit of trouble to add some formatting. In the average business, they’re fussy about such things as the alignment of numbers and the clear delineation of totals, and summary lines. It also is easier on the eye. It is therefore handy to format pivot table reports in HTML. We can send them via email them, straight from SQL Server, all in their correct formatting, or put the reports on an intranet and update them daily or hourly. With the contents of this workbench we show you how it is done, and how easy it is to do, all without a .NET programmer in sight! The basic code to do the report is pretty simple. For any sort of portable solution that will work on SQL Server 2000, dynamic SQL is the traditional solution. Basically, the stored procedure generates the tedious code and then executes it. Why, one wonders. This is because there are a number of tweaks that have to be made, such as the order of the columns, and rows. After all, wouldn’t someone want the report ordered by the number of sales of the salesman rather than just alphabetic order? The same basic query may generate a lot of different aggregations. Pretty soon, some sort of automation will be required. Keith Fletcher contributed to Simple-Talk the ingenious but complex stored procedure that did cross-tabs in his excellent article Creating cross tab queries and pivot tables in SQL. Because we were awed by its grandeur, we didn’t initially want to add our own contribution. However, we had two another objectives, firstly to show how easy the technique can be, and also because we wanted to do more, encouraging you to try things out, and secondly, because we wanted to show how one might mark up the presentation of the crosstab. -- and see what happens! 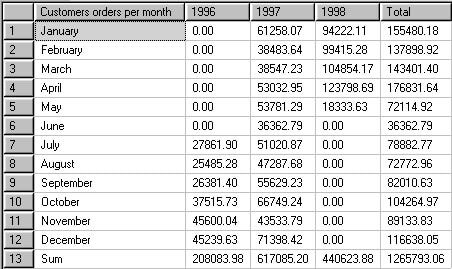 -- before the @Title ='Customers total orders per year'-- Neat Huh? Why bother with this when the Internet abounds with such Cross tab or pivot-table procedures? This is because we are going to take it one stage further so that, instead of just producing a resultset, we want to show how to produce HTML to produce the chart like the one at the beginning of the article. You will have noticed a few things here. The inputs are the same as the first stored procedure, spDynamicCrossTab. This means that you can try out your parameters in SSMS until you have things the way you want them and then you can just move to spDynamicHTMLCrossTab to concentrate on getting the presentation aspects as you want. We have separated the style from the code. All presentation is in an inline style block. This means you can change the way the crosstab looks to your heart’s content. with both stored procedures, you can specify the order of both the columns and rows precisely (it is always nice to have the months, or the days of the week in the correct order! '<!DOCTYPE HTML PUBLIC "-//W3C//DTD HTML 4.01 Transitional//EN"
So that’s it. We’ve enjoyed ourselves trying things out, and we’ve been surprised how far we can take the dynamic creation of pivot tables. We suggest you take the workshop and explore the ideas. If you discover anything interesting, we’d love to hear your comments! We’d particularly like to hear of interesting CSS layouts, though displaying them on Simple-Talk will be very difficult. While this is a good article a lot of time an effort goes into creating a dynamic pivot SP. I don’t know why people bother. GeckoWare Australia (my company) has been selling(online) our Crosstab/Pivot Extended Stored Procedure for SQL 2000 and SQL 2005 for the past 5 years. This si a great tool and one that can turn the nightmare of created pivots into a 2 minute process. Our tool even support multiple value and multi crosstab columns all for US$150 per server instance. Great article but a lot of time wasted. constructing a dynamically generated crosstab resultset using the Pivot function in SQL 2005.!? I have data that spans various years, but the range is flexible depending on the object on whom the data is currently being aggregated. I.E. Product sales over the lifetime of availability, ranging over the various product types. I don’t want to write a separate function for each product type (since this is the dynamic content), rather just generate the year-sales column on the fly. Thanks for the compliment. We really appreciate that. Perhaps we didn’t emphasise the fact well enough but Greg of Geckoware may not have spotted that we were aiming to go beyond doing a pivot, in order produce HTML presentation-quality reports of the results. I may have missed something, but I don’t think that Geckoware does this! Other than the bitmaps of the SMSS results grid, The various illustrations in the article are done by pasting the HTML output from the code directly into the article. No trickery or bitmaps. This is the actual output. Apologies to JJ. Robyn says in the article ‘Why bother with this when the Internet abounds with such Cross tab or pivot-table procedures?’. We needed to do this so that you end up with two procedures, one that produces a plain crosstab that produces a resultset, and another one with the same parameters for doing the result as an XHTML fragment, for pasting into reports or HTML files. With the two procedures, you can use the first to develop reports for the second. It saves quite a bit of time. Appreciate the article, but I’m not personally sure about the maintainability of a stored procedure containing embedded HTML tags. Has anyone put any thought into a pivot table that also uses SQLXML to generate an XML data set that can then be styled into HTML using xslt? I know you could argue that this is XHTML and hence XML but there is still a world of difference between embedding tags and letting SQLXML do the leg work. I’m about to go on vacation otherwise I’d have a play here myself – maybe when I come back! Hmmm just had a crashing realisation – of course SQLXML doesnt support grouping constructs which is the raison d’etre of pivot tables. Guess some further thinking is required…. We initially decided that we’d go the HTML/XHTML route purely because we wanted something that the SQL Server 2000 people could join in with. This is a wonderful topic. Pivot tables are one of the best data mining capabilities in SQL. Any time someone gets away from a series of hard coded CASE statements you really extend the functionality of your code. I have written a number of articles on the same theme using pivot queries and a table with date ranges to generate a rolling window of time. You may enjoy looking at some of those at http://www.sswug.org. Just for the record the above query works on SQL Server 2000 with the SQL XML 3.0 library. In common with many of your readers I’m sure we still find our clients primarily using 2000. And SQL Server 2008 is looming….! Well, you can do extended calisthenics to do this type of PivotTable reporting using SQL, but SQL is fundamentally not the optimal tool for the job. Dimensionally-modeled databases/cubes do this type of reporting very easily. A cleaner and simpler way of doing all the above is to use Analysis Services (or another OLAP engine) to construct a cube, with queries written in MDX (multidimensional expressions), not SQL. Fortunately the end-user tools (including Excel PivotTables, or HTML equivalents), produce the MDX themselves automatically when the user drags-and-drops selections in the PivotTable. You can write your own MDX queries if you want to, but it’s not required. At a previous job, we had a .net app that generated HTML pages, complete with tables similarly formatted using tablestyle css. We had a few additional features: colspans in header rows, and oddrow and evenrow background color options. A sproc unioned these rows into it’s output along with a Format column, not used in the table, that was populated with a row type case statement. We then iterated through the rows and columns to set the styles and content. I’ve just popped a SQL Server 2000 version of the second stored procedure in the ‘speechbox’ at the top of the article with the other two files. In SQL Server 2000 you have to use a temporary table intead of a table variable. You also can’t use Varchar(MAX) and there is a bug in the GROUP BY which gives an error with perfectly correct syntax! Before seeing this, I did change the VARCHAR(MAX) appropriately for SQL Server 2000, and I was attempting to fix the GROUP BY stuff as well. The character restriction limited the prettifying. In SQL2K5, you don’t have to pivot or use case statements to make the XML pivot because the practical difference between 1 row by 5 columns, each labeled ‘td’ and 5 rows with one column labeled ‘td’ is nil. Instead of using the Order Year to form the basis for dynamically generated columns, you can simply take a distinct of the order years to generate a list of fields labeled <th>, then use the OrderYears to ensure that your data fields are presented in the same order. The code is a little more off the beaten path, but it isn’t any more difficult to maintain (when properly documented) than a dynamic SQL statement, and the only hard coded value in it is the number of years presented as columns. Remarkable! This gives exactly the same XHTML code as the spDynamicHTMLCrossTab, and passes through HTMLTidy without a word of reproach. I’d begun to think it wasn’t possible. The importance of this technique could be far reaching as it shows how table-based XHTML fragments can be generated directly from SQL without string-manipulation trickery. Attach a CSS style-sheet and you then have presentation of data. What I like about it is that it isn’t just for reporting; I have some schema elements that the front end wants to display horizontally, but storing each of their “attributes” in a different column leads very quickly with us to scalability issues (“add a column” has been a very frequent Change Request around here). That XML approach has allowed me pivot what they want to be horizontal into a vertical storage space and solves my scaling problems. There are crosstabs and then there are crosstabs. Very nice. I didn’t need the summation, instead I needed to simply turn a table on its side making one of the columns to new headers. Basically I created a new temporary table, then used dynamic SQL to add all the needed columns to it. Next I used another dynamic SQL select statement to populate the temporary table. It definitely isn’t the prettiest solution in the world, and really leaves me longing for SQL2005, however it does work. The most important thing to realize to make this work is that temporary tables can be used and modified between regular and dynamic SQL as long as they are not created in the dynamic SQL. Now that I have spend the time doing this I am going to take a look at that reply who says they have been selling an automated sproc for this. I am going to be really happy, though slightly depressed over the time I waisted, if their offering works. Conversion failed when converting the varchar value ‘Sum’ to data type int. Can anyone tell me what I do wrong? Thank you very much for this wonderfull same code! Seems to work but I have a couple questions. 2. when running the html sp I get 2 results. 1st one is ‘Select @Headinglines=coalesce(@headinglines,'<div id=”MyCrosstab………. what is the 1st result for? You write a SQL column and your name is Phil Factor? Is that real? Hi, I am not sure how to do this but is it possible to add another column to the report, such as for the ‘No. Sales per year’ example, maybe adding the postal code from the employees table? Would it be easy to change the sp to accomodate this? Thanks. Yes, it is very easy to do. In the example, you are getting firstname+lastname, but you can add anything else from the result that you are specifying and it should work. So I can have 2 columns separted by comma? How do I modify spDynamicCrossTab to not display the bottom row ‘Sum’? Is there any way to only select the top 10 rows?